It’s been a busy few months since we launched Hip Thruster. Since then, we’ve had a steady stream of orders coming in. Hopefully, you’ll start to see them appearing in gyms near you, if you haven’t already. Since a lot has happened, I thought it was time to share with you some of the recent developments. Initially, the Hip Thruster was only available in the US. After launching, I received many emails from people outside the US who also wanted a unit. So I worked with Chris Beardsley, who is based in the UK, to partner with Metal Rhino, a gym equipment manufacturer based in Northern Ireland. In mid-November 2013, the Hip Thruster was launched across Europe. Now, operations in Europe have expanded and the team has already taken orders and enquiries from across Europe, Canada, Australia, Mexico and the United Arab Emirates, to name just a few! To kick off the launch of Hip Thruster in Europe, the first ever Hip Thrust Championships were held in Manchester in the UK just before Christmas. The competitive spirit was apparently in full force! A video was shot on the day showing the Hip Thruster units in action and getting comments from some of the competitors. I was sorry I couldn’t make it over from the US – it looks like everyone had an awesome time. This month, we set up a dedicated Hip Thruster page on Facebook so that we can keep you up-to-date with developments and promotions. Like our Facebook page and please tag us whenever you post up videos and photos of your Hip Thruster unit in use. Congratulations on this product Bret. What a great accomplishment. Brett, the linked video of the competition won’t play. I even tried a youtube search for “hip thrust championship” as will as for “hip thrust competition” neither of which produces relevant results. Too bad, I was really looking forward to viewing the contest you described. It’s not a YouTube vid so that likely explains why you can’t see it…maybe you have to download something or update something. Again, my apologies. Any chance you’ll ever produce a slightly less heavy-duty version for home users? 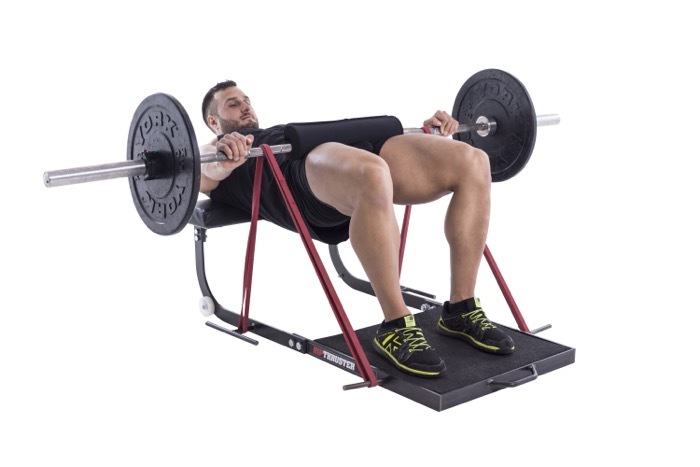 Also, is there any way the hip thruster will ever ship to Canada? Brett, that is awesome man. I couldn’t imagine inventing an exercise and a bench for it and it goes world wide. What are the rules for Hip thrusting? Do you have to hold the top position for a bit, feet can’t move, body can’t slide on the bench? Why no shipping to Canada? I work in a factory where we ship and receive steel and parts all the time there. What an awesome testament to your personal integrity and marketplace ingenuity!! I pray for your continued success and prosperity as you help us all champion our wellness and fitness goals. Where can I buy the various resistance bands that used to be included for sale with the Hipthruster, and why on earth aren’t they sold on the website anymore?